the three word phrase "a long way" is scarcely a definitive measurement of distance. your long way may well be several kilometres or dozens of kilometres longer or shorter than my long way. though i originally began quoting metric distances as a means of equating my own paltry efforts with those in le tour and other professional races, i have stuck with it because an eighty kilometre bike ride sounds so much more impressive and arduous than a fifty-mile pooter around the principality. when relating the weekend's velocipedinal activity to listless monday morning colleagues, even i can see why they switch off at the sound of more kilometres than would be necessary to drive to the village supermarket. for those of us with a long history of bike riding, it is ever so easy to forget the standards of the unenlightened. however, accomplishing a mere 160km over the course of a couple of days at the weekend, interspersed with at least a couple of restorative coffees, rather palls into insignificance when compared with those on a mission. and by mission, i mean a real mission. chaps like rapha's ultan coyle; one of the finest graphic designers it has been my pleasure to meet, but a real headcase when it comes to undertaking feats of derring do-on the bicycle. and i mean headcase in the nicest possible way. 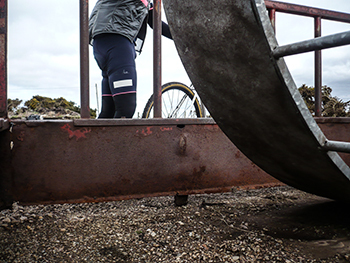 he and two other rapha riders recently completed the 700km bike race across less than populated regions of south africa known as the tour of ara, an escapade about which you can read more on rapha's website (see link below). however, though ultimately it's the bike ride that drove them to such an impressive undertaking in the first place, as a sideline, they moonlighted as test beds for rapha's new brevet range, including a couple of items unavailable until the sun shines high in the sky. personally, 700km of unsupported riding over difficult terrain under a time limit of six days is most certainly what i'd call a long way and considering the conditions under which the tour of ara exists, it's most definitely a long way too far. that does not, however, preclude my wearing of similar clobber as subjected to the heat of the mid-day sun. i like to think that a mere 85 kilometres in hebridean rain merely offers an alternative way of looking at things. of course, 85km is hardly a definitive distance over which to base one's judgment as to the efficacy of a pair of dark blue (with pink trim) bibshorts. fear not, for though not possessed of mr coyle's inimitable spirit, i took the liberty of almost tripling that distance over the course of my review period. it was only saturday's 80km that featured incessant rain. and i'd be guilty of fibbing were i to portend that i thought any velocipedinal ministrations i might impose would ever be sufficient to cause the brevet bibshorts in question, anything like undue hardship. 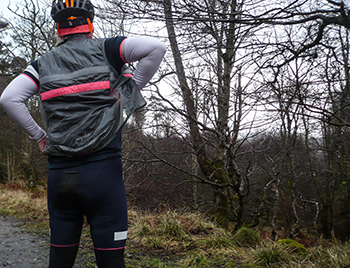 i was, not unnaturally, intrigued to test the veracity of rapha's claim that this particular breed of bibshorts "... can be washed and then quickly dried overnight, ready to be worn again the following day." while i may not be able to squeeze an arid 700 kilometres in before a hearty breakfast, i do know which buttons to push on the corporate washing machine and test this taunting contention. 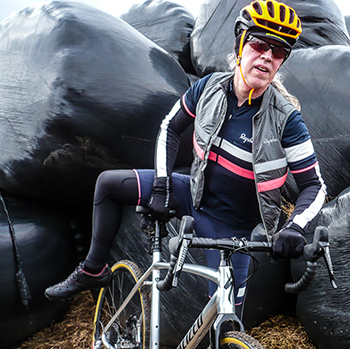 were it to prove untrue, i'd have been well within my rights to emulate other corners of the cycling press, by appending the word exclusive to my review, keen to incur notoriety by disproving the kernel of rapha's marketing. surely my chances of fame and fortune would be assisted by temperatures well below those of central africa and a continuation of the rain that effectively prevented the brevet shorts being hung on the washing line of an indeterminate period of nocturnal dessication? sadly for me, anonymity will remain my bedfellow, for on rising for the sunday morning ride, the shorts were found to be as dry as they were when removed from the packet. and while we're discussing the properties possessed by an admittedly attractive pair of bibshorts, i believe it to be the case that, after they have been lovingly sewn together by an italian seamstress, each pair of brevet bibshorts spends a period of six weeks in a fluffy bunny farm in essex. how else could any pair of shorts be as soft and comfortable as these? as you would expect, the fit is impeccable with an improved synthetic pad ensuring many a long kilometre of unbridled comfort. there's a peforated reflective white stripe on the lower leg while the wide leg gripper with silicon gloop is in a loud fluorescent pink, matching that of the brevet jersey and insulated gilet. it seems such a shame that ultan and his colleagues wore these stylishly coloured garments through one of the least populated regions of the world where there was no-one around to cast admiring glances at their choice of long-distance clobber. and it's just as well they dry overnight, because the desire to wear them continuously is one that seems not to go away. rapha's brevet bibshorts are available in dark blue only, in sizes xs to xxl at a cost of £180.